But it isn't it's Silver Birch, Betula pendula. Confirmed by other botanists during a Tree ID In Winter outing. Mitchell (1976 ed) confirms "at first shiny red-brown like cherry tree." Surprising, isn't it? Well, I was surprised. Observation of the upper twigs with binoculars confirmed that it was Silver Birch - sorry, couldn't get a good photo. 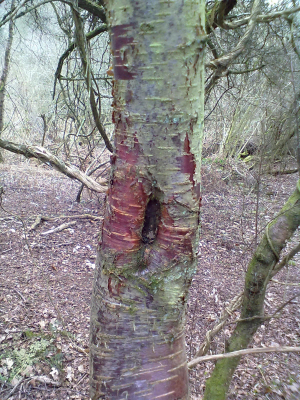 This was part of a stand of B. pendula of varying ages, allowing us to see the progression from this red bark on the younger trees, to the more familiar white-grey with black diamonds on the older trunks. I think this illustrates the difficulty of using bark to ID trees in winter: buds are a much better bet!